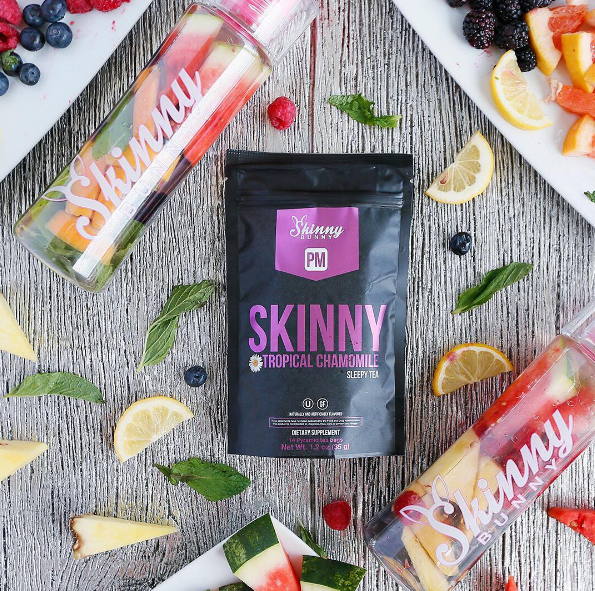 Skinny teas are all the rage right now! They are taking Instagram by storm with pictures of girls with flat stomachs sipping on tea. So, what’s all the hype about? I tried three different teas and here are my thoughts! First, let me start by saying nothing is going to replace eating healthy and working out. None of these teas were a quick weight loss trick where you could eat pizza and drink beer and still have a bikini worthy belly. However, some of them did surprise me. Photo courtesy Flat Tummy Tea. I first learned about “skinny teas” when Flat Tummy Tea reached out to me. I was interested in working with them after I saw their Instagram posts so I thought I’d give it a try. The 28-day cycle consisted of an activate tea and then a cleanse tea. 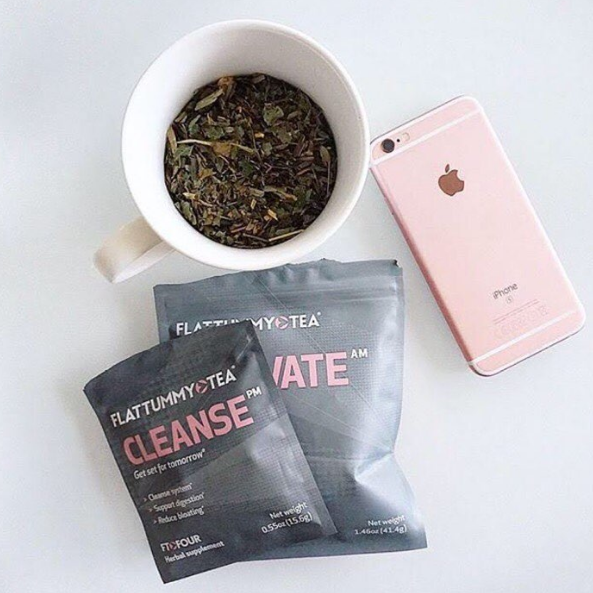 You drink the activate tea in the morning and then every other night you drink the cleanse tea. I will say, both teas tasted surprisingly pleasant. I did feel like the morning tea gave me a good burst of energy and never left me feeling jittery or foggy. I would say the cleanse tea was only really helpful during the first week of drinking it. The morning after the first time I drank the cleanse tea I had a little bit of a stomachache and the cleanse tea did its job. I would say after my third time drinking it my body was used to the tea (or cleansed out) and I didn’t notice a difference between drinking it or not. Although when we went out of town for a week and a half and I forgot the tea, I did notice a difference when I started drinking it again. It was like the first time all over again. My biggest complaint about the tea is that it is a loose-leaf tea. That means you have to use a tea strainer and it takes extra work. For someone who likes for things to be fast and easy, especially when it comes to making tea, I definitely prefer a regular tea bag to save time. Photo courtesy Skinny Bunny Tea. The second company I tried was Skinny Bunny Tea. Overall, they had the best tasting teas out of the three I tried. The vanilla chai was my absolute favorite! Not only did it taste amazing, but I felt that after drinking it I was refreshed and ready to tackle my day. I also liked how they have detox water bottles with recipes for natural cleanses (like adding lemon) and even workout plans. I think this a tea that helps to compliment your healthy lifestyle with guides and tips to help you get more fit. We all know drinking more water is beneficial and I think that is what this company strives for. Skinny Bunny had a tea for the evening but it had some caffeine in it so I only drank it in the afternoon so I wouldn’t disrupt my sleep. Also, it did not offer any bathroom cleanse teas. Photo courtesy Skinny Mint Tea. The final company I tried was Skinny Mint Tea. I found that it was very similar to the Flat Tummy Tea in terms of taste, energy and cleanse effect. The biggest bonus was that it came in actual tea bags so there was no mess and hassle of loose leaf tea! So, what’s the ultimate skinny on skinny teas? Just like there aren’t any magic diet pills, these teas aren’t your cure all and should not be used for extended periods of time. I have tried just three teas in over a year. Since they have herbs that have diuretic and laxative effects, it’s not something I want my body to rely on. I like them in addition to a healthy lifestyle when you have a big event going on that you want to look your best or, for me personally, when a big event is going to coincide with my period. 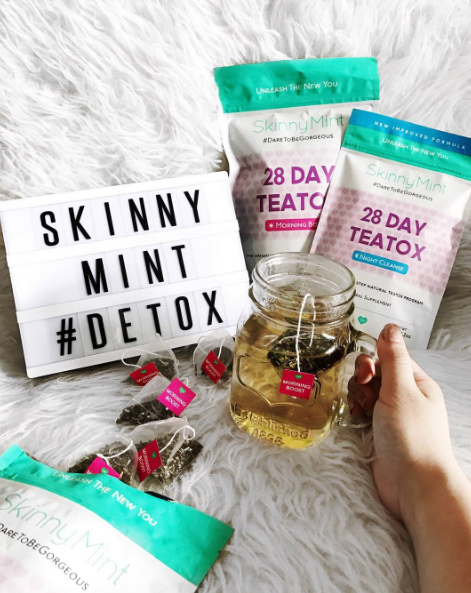 Let me know your thoughts on skinny teas and if you have tried any of the teas I tried!